Three vertebrates, a true bug, and bonus cat for your tank. Ringtail possum, Pseudocheirus peregrinus, sheltering in our climbing rose by our back veranda. This one hung around for a few days before moving on. They are fairly common around here, and generally rather sweet and inoffensive. They often live in small groups, and will sometimes build a spherical nest out of twigs and leaves. Slender billed corella, also known as the long billed corella, Cacatua tenuirostris, feeding under some gum trees near a local park. Birdlife Australia has a page on them here. 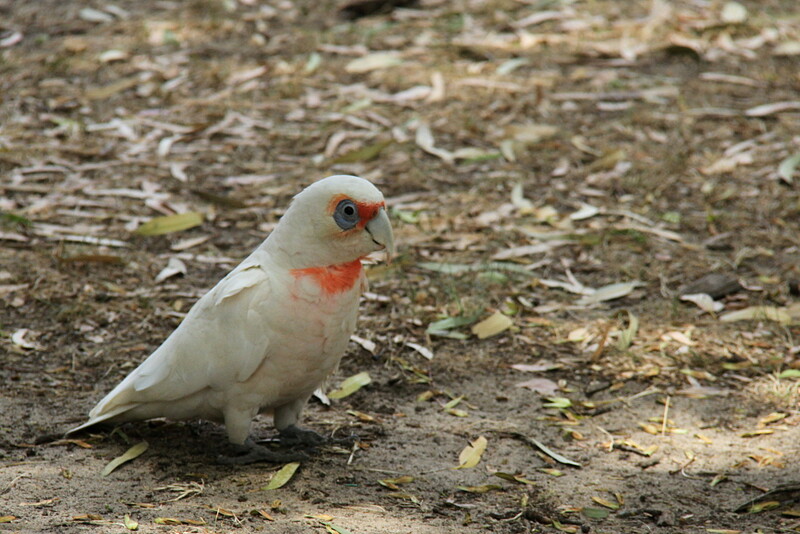 The other corella resident in South Australia is the little corella, Cacatua sanguinea. 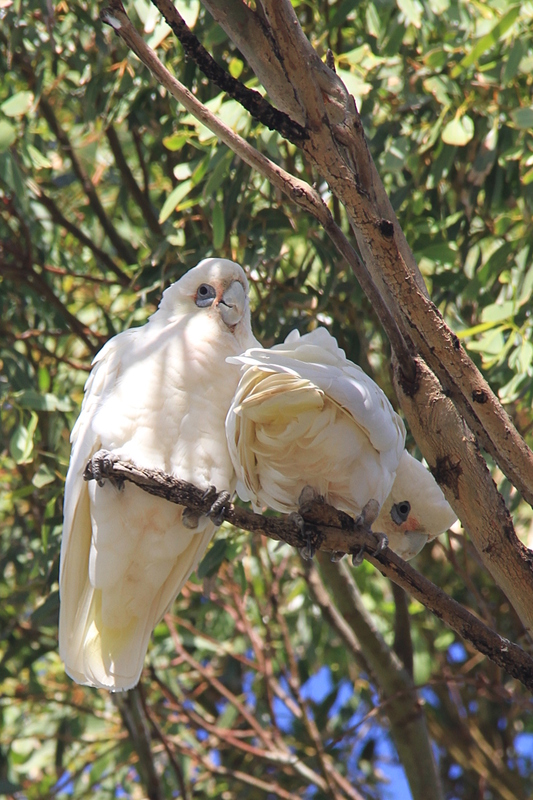 This pair were photographed at a park in Port Elliot. Birdlife Australia has a page on them too. The insect is, I think, a juvenile seed bug from the family Lygaeidae. It was also photographed at Port Elliot. Many bugs from this family feed on toxic plants, so the colour is a warning. This one is about 6mm long. Bonus shot of Zodie, taken about a year ago. She is now nearly 13 years old. Not the world’s smartest cat, but she is very pretty, and also good company. I was trying to do justice to her eyes and colour here, while keeping the depth of field very shallow. This entry was written by whyevolutionistrue and posted on November 24, 2018 at 7:45 am and filed under birds, felids, insects, mammals, photography. Bookmark the permalink. Follow any comments here with the RSS feed for this post. Both comments and trackbacks are currently closed. Looks like a tortoiseshell in the wild to me. 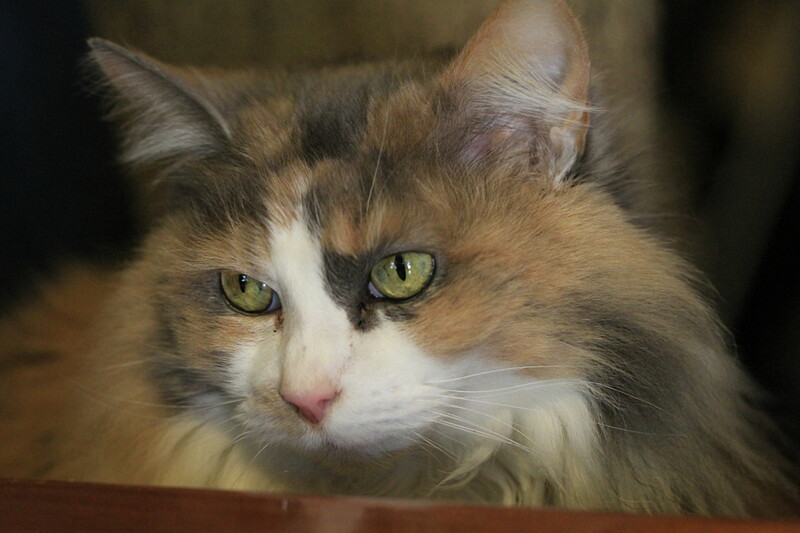 Zodie – perhaps she is not the smartest – but there is the wisdom of the ages in those eyes. ++ That is one good looking cat. Beautiful cat, beautiful picture as well! That seed bug looks rather like one of our milkweed bugs which also live on toxic plants. Good shots. Zodie is a beautiful cat. I like the lights in her eyes. The choice of shallow focus worked really well there. Zodie is indeed very pretty. Some interesting colors. I wonder the origin of her name. – Zodie as a kitten was fluffy, cute, and mostly harmless. – She had an apparent ambition to wrestle my hand into submission, and then disembowel it. She never managed to do any real damage. – Cats do terrible damage to Australian wildlife. But Zodie was destined to be a strictly indoor cat. Her impact has been low. – I have an amused contempt for astrology, so calling a cat a diminutive of zodiac mildly amused me. – And it is short, distinctive, and rolls fluently off the tongue. Important features in an animal’s name. Thanks for the story. The name sparked a memory of mine having nothing at all to do with cats. When I was growing up in Burbank, CA, there was a local discount chain store called Zody’s (https://en.wikipedia.org/wiki/Zody%27s). Your mention of Zodie’s attempted disemboweling of your hand also reminds me that our cat, Brio, sometimes gets so carried away with affection for me that he engages in a death-grip on my hand where he engages teeth and claws with maximum pressure. As he is now fully grown, this hurts a lot. I know he does it out of love because it happens after some vigorous petting and he is purring loudly the whole time. The only way I can dislodge him without hurting him or ripping my own flesh further is to knock him off the table or bed he’s perched on so his own survival skills kick in. The ring-tailed possum is cute. The possums around here are mighty ugly; and they need to evolve a fear for roads and/or cars. Yeah, ours could use a little fear of roads. Many of them get squished. And some get electrocuted clambering around on power lines, which they use as highways. The population as a whole seems to be doing ok though, at least locally. 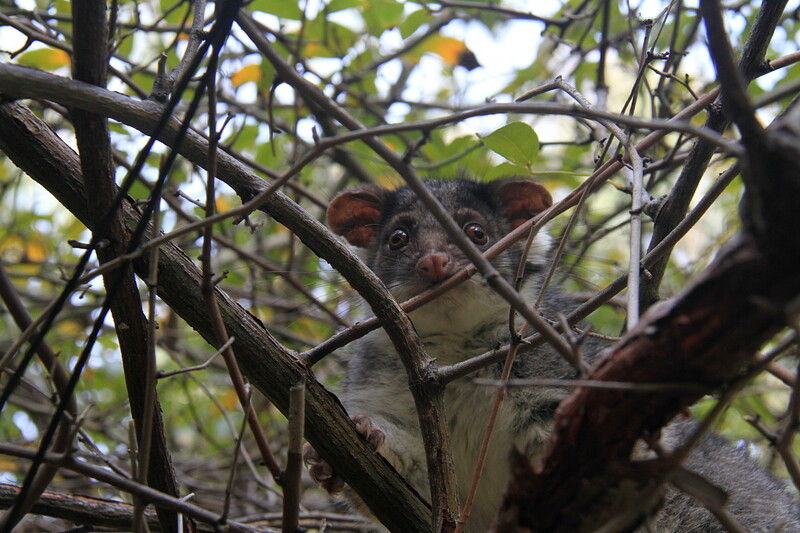 We’ve also got a larger species of possum, the brush-tailed. They are aggressive, noisy, and sometimes destructive. Less cute than the ring-tails, but still kind of engaging. Ah, possum parties. Our previous house we used to get a lot of those. The possums used to drop about 6 or 7 metres from the tree tops onto out steel roof, with huge thumps on landing. Seems they thought the roof was a trampoline. Then they’d hiss and cough at each other, and chase backwards and forwards scrabbling like crazy for ages. But spotlighting them they were always brush-tails. Maybe yours are too? In my admittedly limited experience ring-tails are usually better behaved than the brush-tails, and much less vocal. But it’s a bit sad that they scare the cats.